Want to make cold brew coffee and need nitrogen to serve. This of course opens up wine and nitro-stout kegged possibilities also. No more stouts on CO2! Next brew: Chocolate milk stout. Need this for wine and mead serving. Expect goo quality from Moorbeer based on past purchases. I decided to add a white wine tap to my kegerator. Since I didn't want the wine to become carbonated, I'm pushing it with nitrogen. This Taprite regulator is exactly what was needed. The Second One Works Great!! The first set I received had the high pressure gauge pegged at the pin - unusable. I called and they sent me a new one. One great thing about MoreFlavor is they send a new unit out right away and then worry about the RMA so minimal time is lost without your beer! Anyway, it took a followup email to get the RMA authorization slip but the broken one is on the way back and my beer is flowing. It's a good regulator, no issues. I bought this for cold brew coffee, knowing that it can also be used to keg wine. Brave new world (beyond CO2 and Beer). Sturdy, works as expected. I set the pressure to between 40 and 45 to get the perfect pour. Decided to use this regulator rather than using an adapter for a co2 regulator due to the higher pressure required, and to reduce the number of connections that could leak. Use it for the beermix gas for my stouts. Works as it should. Can't dispute the reliability but the regulator with the built in adjustment knob is much easier to adjust as you don't need to chase around for a screw driver. 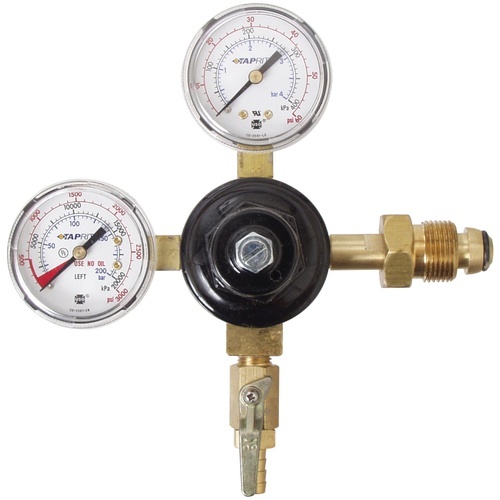 It is cheaper and it works just as well as the regulator with the built in adjustment knob.